A “gripping, heartwarming” (Bookpage) novel about a family separated by oceans, generations, and war, but connected by something much greater—the gift of wings. On March 29, 1973, Prudence Eleanor Vilkas was born with heart-shaped wings pressed accordion-style against her back. Considered a birth defect, her wings were surgically removed, leaving only the ghost of them behind. In 1980, Prudence’s mother takes her from Nashville to Florida, to a town inhabited by people who have run as far as they can without fins or wings. In this new town, Prudence is befriended by a boy who can see what others can’t, including Prudence’s ghostly wings. The unexpected and unimaginable bubble up from the depths of the Atlantic to confront Prudence when she meets her long-estranged Lithuanian grandfather and discovers a miraculous lineage beating and pulsing with past Lithuanian bird-women, storytellers with wings dragging the dirt, survivors perched on radio towers, lovers lit up like fireworks and heroes disguised as everyday men and women. Above Us Only Sky spans the 1863 January Uprising against Russian Tsarist rule in Eastern Europe to the fall of the Berlin Wall and Lithuania’s independence in 1991. It is a “daring, imaginative” (Milepost magazine) story of mutual understanding between the old and young; it is a love story, a story of survival, and most importantly, a story about disovering where we belong in the world. Young-Stone seamlessly balances Lithuanian history with magical realism in this “amazing, spellbinding, incredible journey” (Literary Hoarders). 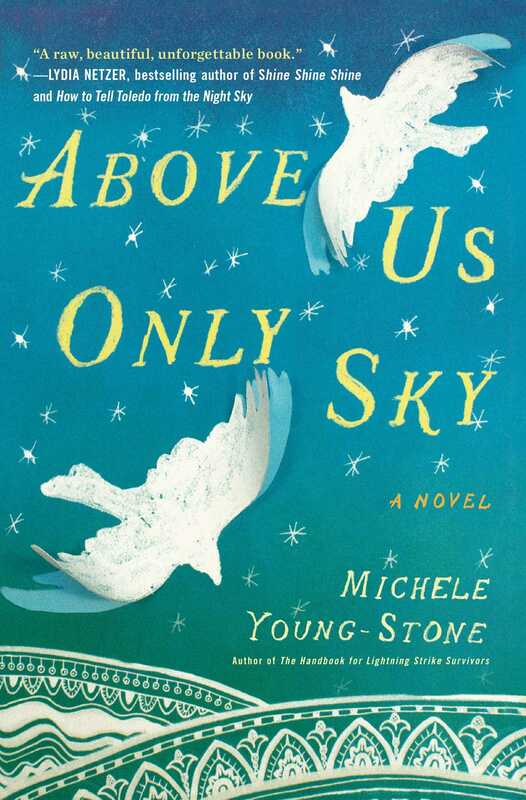 This reading group guide for Above Us Only Sky includes an introduction, discussion questions, ideas for enhancing your book club, and a Q&A with author Michele Young-Stone. The suggested questions are intended to help your reading group find new and interesting angles and topics for your discussion. We hope that these ideas will enrich your conversation and increase your enjoyment of the book. Prudence Eleanor Vilkas is born with a set of wings. Unlike her ancestors who retained this mysterious feature, Prudence is stripped of her wings shortly after birth by a surgeon who deems them a defect, and only the scars remain. Carrying with her the ghost of what she was born to be, Prudence struggles to know and love herself and find her place in the world amid a fragmented family. A thousand miles away, an Old Man reflecting upon his life thinks about Prudence and decides upon one thing: He will travel from New York to Florida to meet the granddaughter he has never known and share with her the powerful and unforgettable stories of their homeland, across the ocean in Lithuania. The story of their meeting—and their fast-approaching final reunion—explodes into an epic tale of all of those connected to them—heroes and misfits, survivors, lovers, and exiles who offer incredible, moving tales of survival, loss, and love lost and regained. Above Us Only Sky is a wild story of faith—in each other and the things we cannot see or explain. Binding all of the stories is a single, invisible thread, illuminating the ways that we remain connected and triumph over separation, tragedy, and even the clock that ticks against us all. 1. The first line of the novel is: “When I was born, the doctor said, ‘I’m sorry.’”(p. 1). Why does the doctor apologize when Prudence is born? How do the other characters respond to Prudence? What other characters in the novel also possess a trait that makes them unique or different, and how do others respond to it? Do these unique characters ultimately find acceptance? 2. Contained within the novel are the stories of many different characters spanning several countries and many generations. Prudence says that their stories “are as much a part of me as my own life experiences” (p. 9). What does she mean by this? Although the novel begins by revealing the feature that makes Prudence different from most, the author also spends much time creating a portrait of the common human experience. What are the commonalities that the characters experience? What might this tell us about what it means to be human? 3. Many of the characters in the novel are also narrators—of their own stories and those of others. What message or messages does the novel present about storytelling itself? Why do the characters share stories? What impact do the stories have upon both the storyteller and those listening to the story? 4. Explore the various myths and folktales that are featured in the novel. What seems to be the purpose of myth? Do the people sharing these amazing stories truly believe in them? Why do you think they tell them and pass them on? How do these subjects open up a larger dialogue about the themes of faith, hope, superstition, and belief? 5. Music is featured as a motif in the novel. Consider where and how this motif is used. What is the role of music in the novel and what message does the novel offer about music and its significance or purpose? 6. What do we learn from Prudence’s tales about her work with birds? What might be the purpose of the stories she shares about her interactions with and observation of birds? 7. Many of the characters are forced to hide or change their identity in order to survive. The Old Man tells his wife, Ingeburg, that his mother’s name was Alexandra. He laments that they never called her by her name. Likewise, he says that “like all men, my father was whatever they called him” (118). What does he mean by this? Likewise, many of the characters are forced from the places they call home. How do the various characters self-identify? What conclusions can we come to then about identity and heritage? What seems to define a place as “home”? In addition to those driven from their homes, several of the characters choose to leave their homes willingly. Why do they do this? Do they ever return home? Why or why not? 8. Against great odds, a pocket watch is passed down through several generations of the Vilkas family. What might the watch represent? Consider how time is treated as a motif in the novel. What kind of view of history is presented in the novel? Inge says that “There is no such thing as ancient history” (p. 40). What does she mean by this? Do you agree? Why or why not? 9. The fractured family appears as another motif in the novel. Many of the families featured in the story are broken or divided in some way. What causes these fractures? Are they avoidable? Are these families ever healed or restored, and if so, how? How does family ultimately seem to be defined and depicted at the story’s conclusion? 10. The Old Man repeatedly tells his life story to his wife, Ingeburg, and others. Is he foolishly living in the past as his son and others suggest? His son does not want to suffer for a past he is not acquainted with. Is Freddie right that it is better to leave the past behind and to live optimistically? 11. Many of the main characters of the novel are survivors of some sort. What is it that allows them to survive when others do not? Most of these characters also suffer from guilt. “Who, I ask, is guiltless?” Ingeburg asks (p. 45). What causes the characters to feel guilt? Do they ever come to terms with this? If so, how? Does their restoration require forgiveness by others or self-forgiveness? Do you believe that these characters are right to feel guilt? Why or why not? 12. The novel presents a complex dialogue about ethics and complicity. Does the novel seem to suggest that there is a clear sense of what is right and what is wrong? Or is right and wrong negotiable? Likewise, does the author suggest that there are “good” and “bad” characters? What seems to determine the complex ethical choices the characters make? Why does Lukas’s father say that some evils are necessary? Do you believe this to be true? Explain. 13. After her rescue, Prudence insists that she did not jump into the water. Do you think that she is lying or do you believe that she slipped? Likewise, do you believe that she really saw her wings when she is watching the film at St. Mark’s Nature Reserve? Why can’t the researcher see them? 14. Evaluate the relationship between generations represented in the novel. How do Freddie and his father, the Old Man, relate to one other? How does Prudence relate to her parents? How do the viewpoints of each generation differ and what seems to cause this? Is there anything that bridges this generational gap? 15. Consider the treatment of faith in the novel. What allows the characters to find faith? Which of the characters experience a loss of faith? Is it ever regained? If so, how? What, for instance, causes Daina’s change of heart with respect to her will to live or lack thereof? Are miracles represented in the novel or do the characters only see what they want to see? How do the representations of faith—or a lack thereof—in the novel correspond to broader cultural notions of faith during the time periods represented in the book? 16. At the conclusion of the story, several of the characters return to the places they once considered home. What are these experiences like? Are the homecoming experiences similar for the characters? Are their homes as they remembered? What conclusions can we draw about memory and the theme of homecoming as a result? 17. The Old Man says, “Lithuanians are nationalists, but not in the same way as the nationalism that spawns wars” (p. 156). What does he mean by this? Do you believe that he is correct? Does a particular viewpoint or message about nationalism ultimately seem to dominate the book? How would the characters have fared if they had placed less value on nationalistic pride and patriotism? Why does the Old Man cling to his nationalism throughout his life? What does he claim that his patriotism actually represents? 18. Consider how the book addresses truth and authenticity. The Old Man realizes that the fairy tales he was told as a child are not true. Daina and Stasys create a false personal story in order to survive. The characters find employment that demands that they propagate ideas they do not actually believe in. What does the novel convey then about how we should read or interpret stories? “Never embrace another man’s idea of the world,” Lukas warns us (p. 132). What does he mean by this? Do you agree? 1. Compare Above Us Only Sky to a few other war novels. What do these stories have in common? How are the characters alike? Who narrates the stories in each, and what points of view are represented? Does any one point of view stand out over the rest? What common experiences do the characters share? What overlapping themes appear among the works? How does Above Us Only Sky stand out from or differ from the other works? Would you say that Michele Young-Stone offers a new view of war and conflict or one in line with past representations? Which storytelling devices or styles seem to be most successful or persuasive among the various works considered? 2. Study the European history represented in the novel. How does Michele Young-Stone’s version compare to other historical representations of this time? Is she faithful to a particular view? Where do readers find her work diverging from historical accounts? Considering this, what might a fictional account of a historical event or period allow people to see that might not otherwise be visible by considering only academic works about the same? 3. Prudence believes that what makes Daina special is not her physical difference but her immortality in art and in story. Consider some artworks created during or after a time of war. What stories do the artworks reveal? Who and what are the subjects and what point of view does the artist present? How does the artwork contribute to its subject’s “immortality”? How does artwork shape popular cultural views of historical and political events and subjects? Do you believe that this is still true today? 4. Compare Prudence Vilkas to other characters in world fiction who have an attribute that makes them seem “different.” Why do they stand out and how do they deal with their differentness? Consider how they reveal the prejudices of those around them. Do they change the minds and ideas of these people? If so, how do they accomplish this? How do these fictional accounts contribute to a dialogue about the real-life cultural issues of prejudice and racism today? 5. Music is a motif in the novel, from the many musicians who appear as characters to the references to popular music written by The Beatles and the Lithuanian national anthem. Listen to some of pieces of music referenced in the book and discuss its personal, emotional effect. Do you relate to or enjoy the music? Why or why not? Discuss also the cultural impact of the music today as well as at the time the music was created. How much do you know about your own family history and genealogy, and how did you learn about it? Were there any revelations about your ancestors that surprised you? I’ve discovered quite a lot, mostly through asking questions, and nearly everything I know, like most history, is subjective. My mother’s maternal family emigrated from Ireland through Prince Edward Island, then migrated south, settling in Brooklyn and parts of New Jersey. My mother’s father emigrated from Alsace at the turn of the century, lied about his age, and fought in World War I as a French translator, actually working with General Pershing. We have photographs and postcards! On my father’s side, our surname was Von Jung (later shortened to Young), and two of my relatives were mapmakers/land surveyors, and their drawings are held in the archives of the Smithsonian. (I don’t know the details, unfortunately, and I have not seen them, but there is still time.) The most surprising revelation about my family’s history is that on my mother’s Catholic side, divorce was considered such a terrible sin that those who did divorce were shunned, seriously shunned, even if the divorce was for a very good reason. Additionally, as a teenager, my mother discovered that her father had had a whole other family prior to hers. She had a half-brother and half-sister. Her father’s first marriage and family were never mentioned. That’s how BIG a sin divorce was. My nana (my mother’s mother) somehow had the first marriage deemed annulled, rendering his first two children basically fatherless. Unfortunately, my mother’s father died when she was fourteen, so we have very few answers. The weight and complexity of Catholicism, and religion, in general, are prevalent in my novels. Did your own family history play any part in the inspiration or evolution of the book? Not very much. They come to play more in my next book. Above Us Only Sky is, in many ways, a historical novel. How did you research the time periods and events featured in the book? What were the most valuable resources? The most valuable sources were the firsthand accounts by two survivors. I was always shocked and in disbelief at the existence of an evil as awful as Nazism and the Holocaust. The revelation that two people, one German and one Lithuanian, could have so much loathing toward the Russian people, even “Russian babies” (from the novel), was perplexing. I was driven to learn more about Russian history. The fact that the men who tortured and murdered Russians, Finns, Ukrainians, Baltic peoples, Balkans, and thousands more were never held accountable for their crimes is horrible. In the wake of war, we allied ourselves with Stalin, the greatest butcher the world has ever known. Like the characters in my novel, we had to choose a side. At that moment, one was preferable to the other. Most definitely, the firsthand accounts on film and in books and newspapers were my most valuable sources of information. What do you believe are the most important qualities of a successful work of historical fiction? Learn everything you can about the history, and then forget as much as you can. Let the characters drive the story. This is a work of fiction. Historical fiction is successful when the reader is caught up with the characters, with their quests and their lives, and the history is only the background, the setting, not the focal point. Faith is a major subject of the book. Did your own faith and beliefs influence the storyline of Above Us Only Sky? Yes. I believe in miracles. I believe that individuals can discover them every day if they’re awake. The characters in your novel are bound not only by the experiences they share but by the stories they tell. Have you been told any stories that remain with you and inspire you or which you are inspired to pass on? Yes. Oh, so many. Too many to tell. When someone says, “I’ve got a story you should write,” my response is, “I’ve already got a million, and not enough time to write them all.” I’m always listening, and my favorite stories are those I’ve heard from my parents, unusual stories about relatives who couldn’t move one hand without the other hand doing the same thing; my grandfather putting money in his cash-register bank every morning, the sound it would make when he pulled the lever. My father being beat up on the way to school. (I’ve already used that one in The Handbook for Lightning Strike Survivors.) My friends’ musical love story. So many little stories, wonderful nuances that add to my writing. Stories stick. They evolve, and they endure. The characters are preoccupied with the idea of “home” and also homecoming. What do you think defines a place as “home”? We can’t control to whom we are born, but after that, it’s up to you. It’s up to me. We make our home. We find our home. We can choose our family, our real family. Home is not static. Home will always be a theme in my writing. Prudence is born with a feature—her wings—that makes her different than most others. Can you relate to her experience of feeling different? Most definitely. When I was Prudence’s age, I was often called “a freak.” I felt out of place and different from my peers. I’m always writing about outsiders because I was one. Which of the characters in the novel do you feel the most sympathy for or relate to the most? I’ve thought a lot about this, and oddly enough, it’s Lukas Blasczkiewicz. When he appeared on the page, I fell in love with him. I perceive him as this man who had this miserable upbringing, a total pawn, trapped, yet artistic, and then he witnesses a miracle, and he becomes one. Lukas is miraculous. He is a maker of joy. Maybe I don’t sympathize with him the most, but I love him in a way that’s unique from how I feel about the other characters. It’s like I learned something from him. What connections are there between Above Us Only Sky and your first novel? Plenty. I don’t always realize the connections. I’m not conscious of them until someone else points them out, and a friend of mine happened to elucidate this for me. Both The Handbook for Lightning Strike Survivors and Above Us Only Sky are coming-of-age novels with female protagonists; they both tell multiple stories that eventually converge. The female protagonists have peculiar, unique male counterparts (Buckley and Wheaton), and there is also always the quest for home, for finding where one belongs in the world. The novels are entirely different, yet the themes replay themselves. How has the story of the Vilkas family influenced your current writing projects or changed the way you write? I learned to take my time. This process was an emotional roller coaster and sometimes I wanted to rush it or simply get off. It was not easy imagining myself on a Siberian-bound train. I learned to trust my editor. As she noted, “Our relationship has lasted more than most Hollywood marriages.” Like my characters, I learned to never give up. I write a first draft in under a year. I write a novel in about four. My imagination is in the first draft. My craft joins us around the fourth or fifth draft. They have to learn to play nice together. Who are some of the storytellers who have influenced your own work? My friends and family. They tell the best stories. Arundhati Roy, author of The God of Small Things, who taught me to have fun with structure. My mind is not linear; neither are my books. William Faulkner, Gunter Grass, Toni Morrison, John Irving, Wally Lamb, Flannery O’Connor, Kurt Vonnegut, and J. D. Salinger. These writers taught me to write with my heart, to embrace my unique voice, and not to be afraid, and if I am afraid of what’s on the page, it’s probably a good thing. I should keep writing. 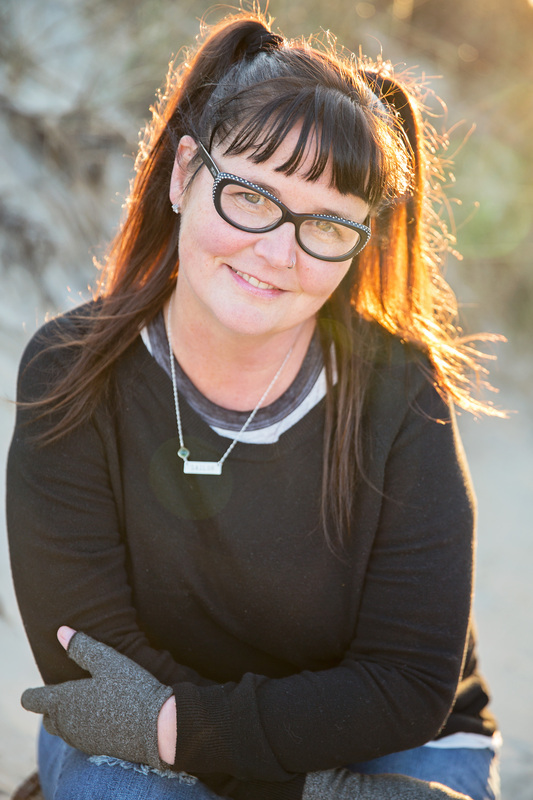 Michele Young-Stone is the author of the novels Lost in the Beehive, Above Us Only Sky, and The Handbook for Lightning Strike Survivors, which The Boston Globe called “an exceptionally rich and sure-handed debut.” She lives in the Outer Banks of North Carolina with her husband and son. "Rich with themes of love and loss. Young-Stone has spun a beautiful tale on the cusp of magical realism, but with 100% pure magical prose."